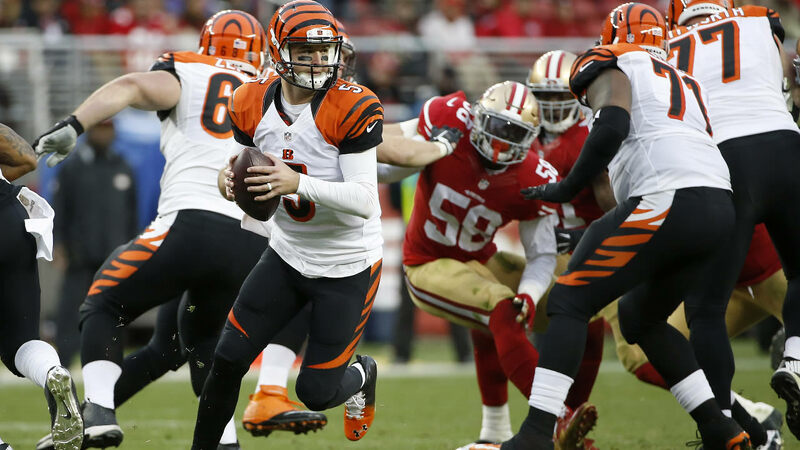 SANTA CLARA, Calif. -- AJ McCarron kept handing off to Jeremy Hill and stayed steady in his first career start to lead the Bengals back into the playoffs. Cincinnati's opportunistic defense did much of the rest. Hill ran for a pair of 1-yard touchdowns to back McCarron's first start, and the patchwork Bengals clinched a fifth straight postseason berth by beating the San Francisco 49ers 24-14 on Sunday. As Andy Dalton watched from the sideline with a large cast over his broken right thumb, McCarron threw a 20-yard touchdown pass to Tyler Kroft just before halftime as the Bengals (11-3) forced three second-quarter turnovers by San Francisco (4-10) to take command. Dalton offered high-fives to McCarron with his good hand. Vontaze Burfict and Adam "Pacman" Jones each made interceptions on balls that deflected off the hands of tight end Vance McDonald. Cincinnati capitalized with touchdowns on two of the turnovers, including Kroft's TD catch one play and five seconds after the second interception. If all goes as planned, the Bengals will return to the Bay Area for the Super Bowl at Levi's Stadium. McCarron, who led Alabama to two national championships and was a fifth-round pick in 2014, went 15 of 21 for 192 yards and a 115.6 passer rating. He became the first former 'Bama player to win an NFL game as the starting quarterback since Jeff Rutledge for the Giants on Nov. 15, 1987, according to STATS. Marvin Jones had four receptions for 89 yards for Cincinnati, which blocked a fourth-quarter field goal but still let San Francisco stick around late until Shawn Williams' pick on the goal line with 1:50 left. Hill carried 19 times for 31 yards. But his fumble late in the third put San Francisco in position for Bruce Miller's 1-yard touchdown, then Anquan Boldin caught a 15-yard TD from Blaine Gabbert in the closing minutes. Typically, though, San Francisco hurt itself. The Bengals, who last month lost their only back-to-back games of the season, patiently waited for the mistakes to come then pounced. Early in the second quarter, Adam Jones - back after a foot injury kept him out last week - intercepted a pass by Gabbert that bounced off McDonald's hands on a perfect pass and would-be first down. But the Bengals failed to make anything of that, before capitalizing on the next Niners' miscue. On third-and-10 from the 20, Carlos Dunlap stripped the ball loose from Boldin and returned it 21 yards to put the Bengals on the San Francisco 11. Hill scored his first TD on Cincinnati's ensuing possession, a play that was initially called no gain but overturned to a touchdown on review. Cincinnati missed more than Dalton, who broke his thumb in last week's loss to the Steelers. Tight end Tyler Eifert - with his 12 touchdowns - sat out with a concussion. Safety George Iloka was sidelined with a lingering groin injury. Wide receiver A.J. Green caught a 37-yard pass in the first quarter for his lone reception, but was limited after being downgraded before the game to questionable with a back injury. Retro end zones were painted at Levi's Stadium, which appeared about half-full on a day San Francisco held a halftime reunion of the 1981 and '88 Super Bowl champion teams that beat the Bengals - Cincinnati's only two Super Bowl appearances. That's as far as the fun went for the home team. The 49ers went 2 for 14 on third down and secured last place in the NFC West for the first time since 2005. San Francisco, already down injured running backs Carlos Hyde, Reggie Bush and Mike Davis, lost Shaun Draughn to a second-quarter knee injury - leaving Travaris Cadet to take over. San Francisco lost right guard Marcus Martin to a concussion in the fourth. 49ers rookie punter Bradley Pinion put one 18-yard punt late in the first half - already his fifth of the game - into the stands behind the 49ers' bench to help set up Hill's second touchdown.